A workshop dedicated to servicing the needs of players of bowed, stringed instruments in the Poole and Bournemouth area of Dorset and beyond. 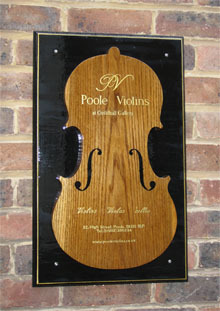 luthiers based in the Poole and Bournemouth area of Dorset, in the United Kingdom. A specialist repairer and maker of violins, violas, cellos and other instruments of the violin family located just off the High Street in old Poole, and within easy reach of Bournemouth, Christchurch and Southampton. We offer a full workshop service for the expert repair, restoration and making of bowed musical instruments. A dealer in the sale of instruments of fine quality. We buy and sell both old and new string instruments and their accessories.